As Americans consider the possible uses of genetic engineering in animals, their reactions are neither uniformly accepting nor resistant; instead, public reactions vary depending on the mechanism and intended purpose of the technology, particularly the extent to which it would bring health benefits to humans. Presented with five different scenarios of animal genetic engineering that are currently available, in development or considered possible in the future, Americans provide majority support only for the two that have clear potential to pre-empt or ameliorate human illness. The survey’s most widely accepted use of genetic intervention of animals involves mosquitoes. Seven-in-ten Americans (70%) believe that genetically engineering mosquitoes to prevent their reproduction and therefore the spread of some mosquito-borne diseases would be an appropriate use of technology, while about three-in-ten (29%) see the use of genetic engineering for this purpose as taking technology too far. And a 57% majority considers it appropriate to genetically engineer animals to grow organs or tissues that could be used for humans needing a transplant. But other uses of animal biotechnology are less acceptable to the public, including the creation of more nutritious meat for human consumption (43% say this is appropriate) or restoring an extinct animal species from a closely related species (32% say this is appropriate). And one application that is already commercially available is largely met with resistance: Just 21% of Americans consider it an appropriate use of technology to genetically engineer aquarium fish to glow using a fluorescence gene, while 77% say this is taking technology too far. 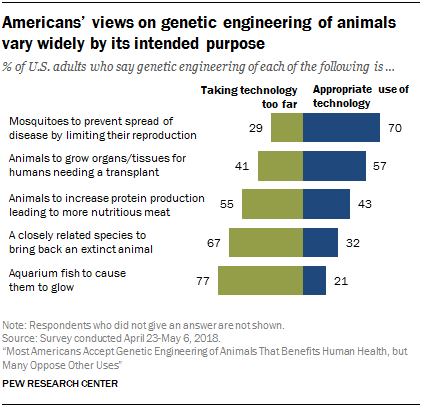 These are some of the findings from a new Pew Research Center survey, conducted April 23-May 6 among a nationally representative sample of 2,537 U.S. adults that looks at public views about genetic engineering of animals – a term that encompasses a range of biotechnologies that can add, delete or change an animal’s existing genetic material and thereby introduce new traits or characteristics. Although most Americans are largely in agreement that using genetic engineering in mosquitoes to prevent the spread of mosquito-borne illnesses is appropriate, views about other uses of genetic engineering of animals considered in the survey differ by gender, levels of science knowledge and religiosity. Men are more accepting of these uses of technology than women, those with high science knowledge are more accepting than those with medium or low science knowledge and those low in religious commitment are more accepting than those with medium or high levels of religious commitment. For example, about two-thirds of men (65%) see genetic engineering of animals to grow human organs or tissues for transplants as appropriate, compared with about half of women (49%). Also, Americans with high science knowledge (72%) are more inclined than those with medium (55%) or low (47%) science knowledge to say this would be appropriate. 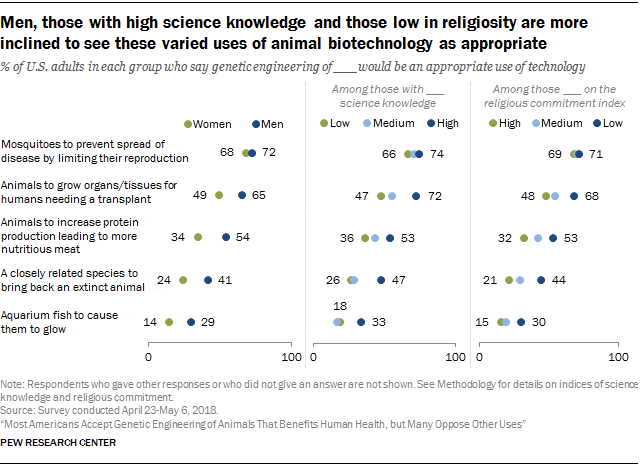 And a larger share of those with low religious commitment (68%) than medium (54%) or high (48%) religious commitment consider genetic engineering of animals to grow human organs or tissues for transplants to be appropriate. Emerging developments in animal biotechnology raise new social, ethical and policy issues for society, including the potential impact on animal welfare. 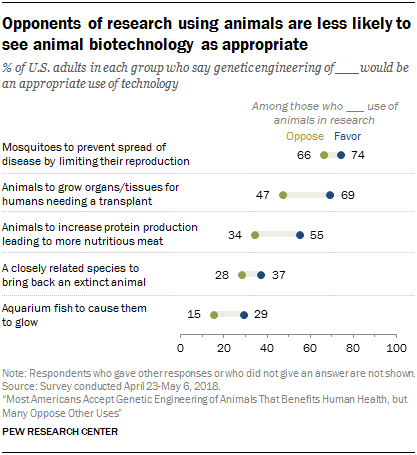 The survey finds that the 52% of Americans who in general oppose the use of animals in scientific research are, perhaps not surprisingly, also more inclined to consider specific uses of genetic engineering of animals to be taking technology too far. There are large differences between these groups when it comes to using animal biotechnology for humans needing an organ or tissue transplant and the idea of using such technology to produce more nutritious meat. To better understand people’s beliefs about genetic engineering of animals, the survey asked a subset of respondents to explain, in their own words, the main reason behind their view that genetic engineering in each of these circumstances would be taking technology too far. A common refrain in these responses raised the possibility of unknown risks for animals, humans or the ecosystem. Some saw these technologies as humankind inappropriately interfering with the natural world or raised general concerns about unknown risks. About three-in-ten of those who said genetic engineering of mosquitoes would be taking technology too far explained that humankind would be disrupting nature (23%) or interfering with God’s plan (8%). Some 24% of those with objections to the idea of reducing the fertility of mosquitoes through genetic engineering in order to reduce mosquito-borne illnesses raised concerns about the possible impact on the ecosystem. Objections to the idea of using animal biotechnology to grow organs or tissues for transplant in humans focused on beliefs about using animals for human benefit (21%) and potential risks for human health from creating human organs from animals (16%). 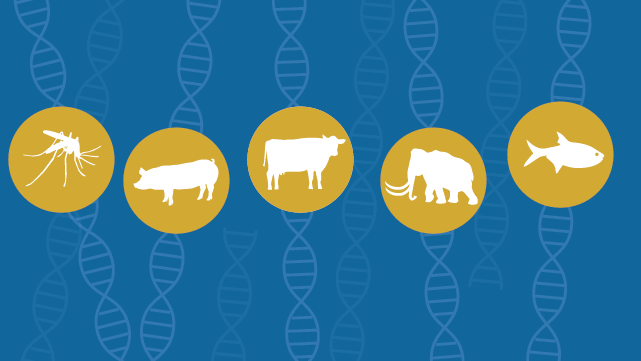 Genetic engineering could produce more nutritious meat by altering animal proteins. Those who think this is taking technology too far raised a number of different concerns. Some cited general concerns about as-yet-unknown risks (20% of those asked), while a similar share (19%) saw this as messing with nature or God’s plan in a way that goes beyond what humans should do. About one-in-ten (12%) objected to the idea on the grounds that people should rely less on meat in their diet or that any genetic engineering in foods is a likely health risk. Those who objected to the idea of bringing back extinct species often raised concerns about unintended harm to the ecosystem. Roughly two-in-ten (18%) of those asked explained their views by saying there is a reason that these animals are currently extinct, with some saying these animals would be unlikely to survive if brought back, and another 12% of this group raised potential risks to other species and the ecosystem from bringing an extinct animal into a different world. Others discussed these ideas in terms of God’s plan and human interference with the natural world (23%). And 14% said they regard bringing back an extinct species as taking technology too far because they do not see a need or purpose to this, especially as it does not seem to bring any benefit to humans, or that resources should be focused elsewhere. Objections to the idea of changing the appearance of aquarium fish using genetic engineering to make the fish glow often focused on the lack of apparent need or benefit to either humans or animals. About half (48%) of those who say engineering a glowing fish takes technology too far said they do not see the purpose for humans or society, questioned its necessity or considered it frivolous or a waste of resources.